Cute apron, Simone. I always write "toms" on my list for marketing. Next year I think I'll pot some cherry toms... I miss having my own. I love cherry tomatoes. Didn't know the bush would come back every year. You must have a garden fairy. Great pic with your vintage dress! They look delicous! I made your super easy tissue holder on the weekend. I've just put my pics on my blog along with a link to yours. Great apron and beautiful tomatoes. They look delicious .... and, your dress is just gorgeous!! You look all summery! Gorgeous dress or apron you're wearing! sep one that neither of you have to *fuss* over!! well, that bush must have really settled there! Lucky you! What a fabulous luxury that would be! Makes me wonder about how it started and survived. That's a neat photo. what a cheerful photo in the best colors and print! love a plant that requires zero attention! I love a plant that requires nothing and just gives and gives. So rare. I hope you enjoyed them! 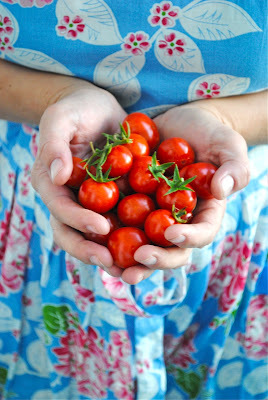 You mean cherry tomatoes don't have to die at the first fall freeze and you don't have to replant them every year? That is fantastic. Oh to live in a warmer climate. The things one learns reading other people's blogs. Enjoy those tomatoes because mine are all about to die in the next month here in Utah, USA.